You don’t like Viognier? My daughter and I find we really enjoy Viognier, especially Virginia Viognier. I actually received several emails express similar sentiment and surprise. One close friend not only expressed surprised and sadness, but also jokingly doubted our friendship because of my confession that I’m not a huge Viognier fan. I’ve given this some considerable thought because of the number wine lovers that I admire who were surprised at my dislike for a grape. I think my problem with Viognier is that the nose offers a flowery perfume of wonderfulness mixed with hints of fruit that is never matched on the palate. After I immerse my nose in the glass, I’ve mentally prepared myself and then…BAM! I taste it, and I’m immediately disappointed. Even if the wine is good, the shock of the switch in characteristics usually leaves me wondering what happened. I’ve found, though, that when I pair Viognier with food, my reaction is very different. The Chrysalis Viognier is a perfect example of that. On it’s own, the wine just didn’t do it for me, but combining it with cheddar cheese took the wine from being average to knocking my socks off. The other thing I’ve realized is that I really enjoy Viognier blends. 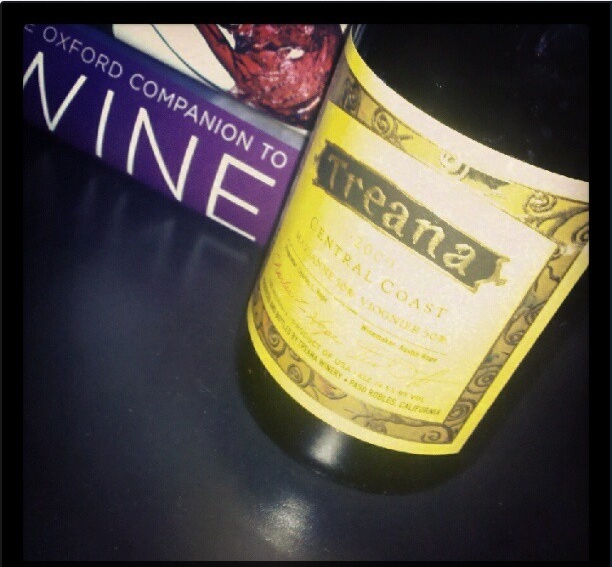 For example, I haven’t had a chance to review the Treana white blend yet, but I’ve tasted this Central Coast California wine at several wine events and loved it so much I bought several bottles for myself. The vintage I have is 50% Marsanne and 50% Viognier, so be on the lookout for a review in the near future. Thank you for calling me out on my grape-hating ways. Once I gave it a little more thought, maybe claiming not to be a Viognier fan was too strong. I love it in blends, and I think it’s a great food wine. But, for just sipping on after work, well, I think I’m still going to pick a different white varietal. Question of the Day: If you’re a Viognier fan, what’s your favorite? I’m actually a Viognier fan. I wasn’t a big white wine fan for a long time but a dry Riesling and a viognier converted me. My favorite is the Quenett viognier. Delicious! I would never truly doubt our friendship, it just means I’ve got my work cut out for me to find you a perfect Viognier! I do agree with you though, I prefer the blends over straight viognier.